Not finding the automatic on-off system to operate power back-up for the night-landing system (NLS) up to the mark, the Director-General, Civil Aviation, has put brakes on the Uttarakhand Civil Aviation Department’s efforts to get the system at Jolly Grant Airport going. Dr D Behera, Director, Lala Ram Sarup (LRS) Institute of Tuberculosis and Respiratory Diseases, New Delhi, today stressed the need to improve the age-old smear microcopy by technology for early and complete case detection. Demanding to implement the Rs 1800 grade pay and assured career progression (ACP) scheme for the non-teaching staff of primary schools in Uttrakhand, non-teaching employees took out a huge procession followed by staging a dharna at the Secretariat here today. Uttarakhand forest authorities are constantly keeping a vigil at Chorpani in the Shivpuri forest range of the state to ensure that the killer tusker does not harm anyone. The strike by the employees of the Peyjal Nigam under the aegis of Officers/employees joint coordination committee in support of their one-point charter of demand for departmentalisation continued on the fourth day also. 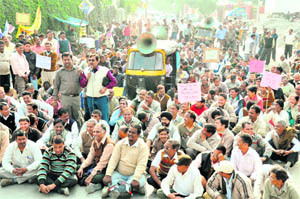 The strike has halted works under the Asian Development Bank , Jawaharlal Nehru National Urban Renewal Mission and the SPMG. Even gravitational and pumping schemes have been affected by the strike. The protest of Opposition leader of Dehradun Municipal Corporation (DMC) Ashok Verma and rest of the Congress councillors turned into a fast today to condemn the deteriorating condition of garbage disposal and other amenities related to the DMC in the city. HNB Garhwal University, Srinagar, and Dr RML Awadh University, Faizabad, today won their respective matches in the North Zone Inter-university Cricket Tournament being organised by Uttarakhand Technical University. The Sardar Bhagwan Singh (SBS) PG Institute of Biomedical Sciences and Research celebrated it fests ‘Saptrang’ here today. 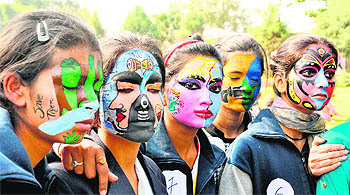 A large number of students participated in various events held under the fest. The programme began with the inauguration ceremony held by Harinder Pal Kaur. Guru Nanak Academy (GNA) won by 21 runs against St Joseph Academy at the Inter-council Schools Senior Boys’ Cricket Tournament match held at St Joseph’s Academy’s ground in Dehradun today. Uttarakhand Chief Secretary Subhash Kumar has called for speeding up work linked to the laying of the Muzaffarnagar-Roorkee railway line. Aggrieved by the non-fulfilment of their demands, members of the Uttarakhand Roadways Deceased Employees’ Dependants Association held a meeting at Parade Ground, took out a march against Uttarakhand Roadways officials and held a demonstration in front of the Secretariat here today. District Magistrate, Dehradun, Dilip Jawalkar has directed the General Manager, Industries, to provide all facilities related to e-governance to members of the Udyog Mitr Samiti (UMS), who work for the benefits of industrial units in the state. 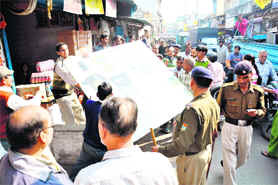 The Dehradun Municipal Corporation and the police today launched an anti-encroachment drive. As part of the drive, officials impounded six rehris at Moti Bazar. Under pressure to begin night landings at the airport before the elections so that it could be touted as an achievement of the government, the state civil aviation authorities were in for a shock when the DG demanded an automatic one-second on-off system for setting up the emergency power-back up at the airport, one among the several perquisites for getting the nod for making the NLS operational. “Earlier, the Airport Authority of India had equipped it with 15-second automatic on-off system for power back-up that had not been accepted by the DG. He is now insisting on a one second on-off system to set up the back-up system,” said PC Sharma, Director, Civil Aviation (Uttarakhand). Now the approval for operating the night-landing system at the airport is hanging fire between the Director-General, Civil Aviation, the Airport Authority of India. “We had held talks about making the NLS operational with the present system, as we may not get that many flights initially. Though the AAI understood our urgency and even agreed for some relaxation, the DG is reluctant to do so,” said Sharma. As of now, the airport has to adhere to the sunset limitation. Therefore, night landings do not take place. Once the night-landing system becomes functional, it will facilitate night landings. The Uttarakhand Government has been missing deadlines for making the NLS operational. It had even made claims of getting the clearance ahead of the South Asian Federation Winter Games, but failed. While delivering the presidential address at the 66th National Conference on Tuberculosis and Chest Disease held here and organised by the TB Association of India, Dr Behera said the early detection included smear negative pulmonary TB cases, extra-pulmonary TB cases and paediatric cases in people living with HIV and AIDS would help in controlling TB cases in the country. “Although our country has the highest number of TB cases in the world, we have failed to develop a good network of laboratories that are accredited. Now under the Revised TB Control Programme (RNTCP), the government is laying stress on building such laboratories throughout the country and also encouraging medical colleges, institutions and private laboratories to get accreditation,” he said. He also called for developing a joint strategy for tackling Drug-Resistant TB. “Multi-drug-resistant TB has come as a major challenge to the global effort to control TB. Efforts are under way to detect and treat such cases under the DOTS plus strategy,” he said. On the other hand, chairperson of the TB Association of Uttarakhand Mata Mangla said the TB Association of Uttarakhand would chalk out a strategy to provide assistance to the TB patients in the state and motivate them to take their medication regularly. While Dr Rajesh Naithani, Secretary of the TB Association of Uttarakhand, said the three-day conference would try to raise awareness about TB. 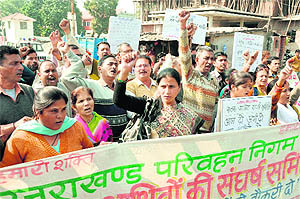 Employees of primary schools hold a protest in Dehradun on Friday. “We will continue to protest in support of our demands and intensify our actions if the state government fails to fulfil these,” he added. The forest guards had sighted the tusker yesterday. Uttarakhand Conservator of Forests Bhagirati SM Joshi today said the tusker was still hiding in the interiors of the Chorpani forest area. “We have thrown sugarcanes to attract the tusker but it seems the elephant is still hiding in the interiors of the forests,” said Joshi. He held that forest guards were fully prepared to deal with any situation. He hoped that with the arrival of Corbett elephants in Chila, the search operations would be further strengthened. Meanwhile, forest guards led by Joshi are camping at Chorpani and constantly monitoring the situation. SP Singh Devra, coordinator of the committee, said after 1975, in order to get assistance from the World Bank, the government had formed a corporation. But in the long-term the arrangement affected the services and conditions of the employees, as they were being denied pension and other retirement benefits. “Our interest will be better served if we are accorded the status of department. 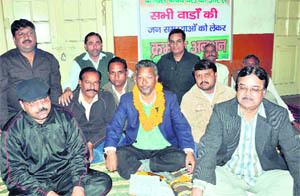 Even the Jal Sansthan has extended support to our demand,” he said. They have threatened to intensify their stir with the employees of Jal Sansthan launching a strike if their demand was not met within a week. The group demanded sanitation and supervision work. There was no talk on extending the protest to fast but surprisingly the members converted their protest to a fast. HNB Garhwal University defeated Aligarh Mulsim University, Aligarh, by four wickets. The Aligarh team won the toss and chose to bat first. The HNB Garhwal University team scored 160 runs for six wickets in 38 overs to win the match. Opener Siddharath Thapliyal with 43 runs laid a solid foundation that as later built upon by Dipankar Ramola and Rohit Negi, who remained not out on 34 and 39 runs, respectively. In the second match, Dr RML Awadh University, Faizabad, defeated Kumaon University, Nainital, by seven wickets. The Kumaon team scored 145 runs all out in 37.3 overs. Nitin Bhalla was the highest scorer with 34 runs. Harshit Singh took three wickets for 31 runs for the Faizabad team. Following it were various creative arts competitions, including rangoli, tattoo, mehandi, collage, flower decoration, card making and face painting. In the later half of the day, debate competition on the topic ‘Women Empowerment- truth or false’ was held. Students presented their viewpoints by speaking for and against the motion of the given topic. Dr Archana Prakash, Chandrima Sharma, Kusum Arunachalam, Professor Varsha Parcha, Dr Sushma Bhatnagar and Dr Aradhna adjudged the competition. The fest culminated with the prize distribution ceremony followed by a vote of thanks delivered by the coordinator of the programme. After winning the toss, the GNA team elected to bat and piled up a total of 123 runs, losing all its wickets in the process in the allotted 20 overs. Satpal Rawat contributed highest 37 runs to the team’s score. Anubhav, Sachin and Mayank took two wickets each for St Joseph Academy. Chasing the victory target, St Joseph Academy could just muster 102 runs, losing all its wickets in the process, thereby ensuring a 21-run victory for the GNA team. 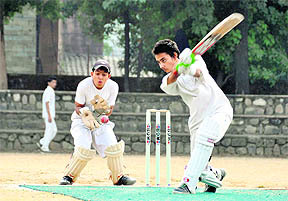 Sachin was the highest scorer for St Joseph Academy. He scored 24 runs. Anubhav of St Joseph Academy stood unbeaten with 18 runs. As of the GNA team’s bowling, Ravinder clinched 3 wickets in his 4 over spell, giving away just 14 runs in the process. GNA’s Pratyush, Naveen and Ashish took 2 wickets each. Presiding over a meeting at the Secretariat here today, Kumar directed for speedy acquisition of land in nine villages of Haridwar for laying of the track. He also said the land would also be required to be acquired from as many as 13 villages of Saharanpur in Uttar Pradesh. The meeting also decided to depute Commissioner Garhwal to visit the villages where land has to be acquired and submit a report to the state government within a fortnight. Chief Secretary directed the concerning officials to ensure that the land acquisition process was kept fully transparent and land rates were thoroughly examined. Subhash Kumar also held that the state government was rendering all assistance to the Railway authorities towards lying of Muzaffarnagar-Roorkee railway track, which is expected to shorten the travel time between Dehradun and Delhi. A large number of association members gathered and raised slogans in favour of their demands. At the meeting, the protestors criticised the state government as well as the department for ignoring their appeal. Hansa Joshi, president of the association, who chaired the meeting said, “The state government is least bothered about the sufferings of dependants of the deceased roadways employees. Today, after 11 years of our struggle, the state government has failed to give employment to us,” she added. However, the protesters have been demanding recruitment of the dependants of the deceased, who worked in the Uttarakhand Roadways Transport Corporation. Their families have been facing financial problems. He asked the GM to make a proposal to provide benefits of the Right to Service Act to UMS members within a week. President of the Industrial Association Pankaj Gupta raised the issue of unavailability of currency of small denominations in banks. On this, the DM directed Lead Bank officer MK Diwedi to send a proposal to him after talking it up with the Reserve Bank of India. The members also complained of power cuts ranging from 5-6 hours for the last two months. The DM directed the Executive Engineer, Power Corporation, to look into this problem. The traffic police also took away two-wheelers that were parked in the no-parking zone. The drive was today carried out at Moti Bazar and Hanuman Chowk.